At what point do you own too any games? Having just moved, I unpacked all my games and lined them up in the only place with enough room for them – the top of a wardrobe. It’s a pretty long line of stuff, and it doesn’t include all the games I keep on the hard drive of my original Xbox (also not pictured: Halo 4, Forza Horizon and L.A. Noire, because they’re all near my 360.) Only one game there is still in plastic (DiRT 2), although there are a few that I’ve only played briefly for whatever reason (most embarrassingly, Just Cause 2, because I thought the original Just Cause was amazing.) The plain DVD case at the top is a backup of ‘Chronicles of Riddick: Escape from Butcher Bay’ because my original copy was damaged long long ago, if you were wondering. How many games do you have and do you think you have too many? As long as I have a chance of finishing them all before my aging 360 RRoDs again I figure I’m alright! 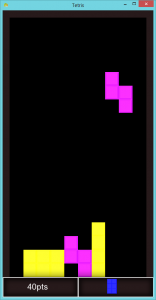 So a few days later I got up and made Tetris. All told it was maybe 6-8 hours work split across two days: Mostly production, with the final couple of hours on day two dedicated to bug squashing. Anyway, it’s super simple but I think it’s kinda neat for what it is. 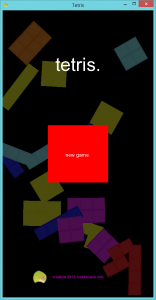 As ever, this game is built with Haxe NME (3.5) – to compile the source you will also need the Actuate tween library installed. Download the source here. Today I’m happy to offer some code from my early prototypes of Tower Defence, build 13 from September/October ’12 if anyone is pedantic enough to want to know. 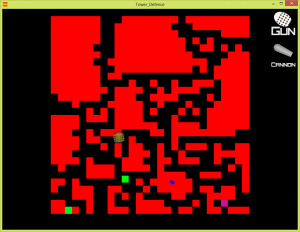 It’s super basic: No maze generating algorithms yet, not much in the way of gameplay. 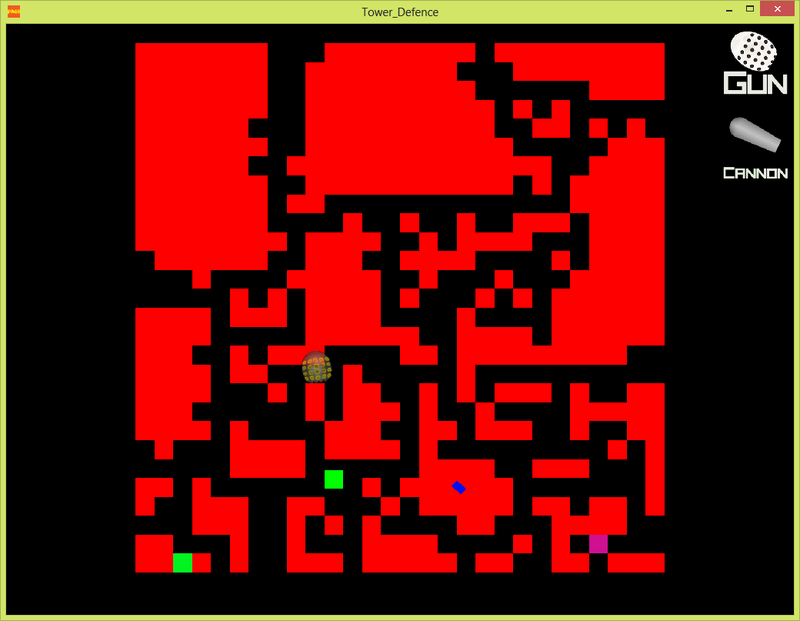 A random maze is created (i.e, each map tile is 50/50 whether its walkable or not), start and end points generated and a route found between them using A*, and an “enemy” (green square) moves along the path. You can create a single weapon type – the gun – which fires very slow moving bullets at the enemy. This code also contains remnants of my quick and dirty collision system, although Box2D is actually running the show. Just a quick one: In re-creating my blog I had to go through one of my least favourite ordeals, choosing a theme. Given time I’d create my own (but, also given time, I’d probably just write my own bare bones CMS) but that’s not an option, so I usually look for simple, clean themes that I can perhaps customize a little bit and be done with. This theme is called Greyville, by the way, it’s rather pretty I think. I actually set this blog up locally using Xampp first so I could import a few posts, do those theme mods and make sure everything worked before it went live. I was using the Greyville theme for a while, and had gotten used to it, when I realized it didn’t support a proper menu bar. So I decided I’d add one, how hard could it be?